Robert Edmund Boomer passed away peacefully on January 2, 2017 in Grosse Pointe, Michigan. He was born on June 17, 1926, the second of five children to Roy and Helen Clippert Boomer. A lifelong Detroiter, Mr. Boomer grew up in the historic Boston-Edison district. He graduated from Detroit Country Day School in 1944 before enlisting in the U.S. Army during World War II and served in occupied Japan. He returned home to attend Wayne State University on the GI bill and completed his degree in three years. Diligent, determined, and wise, Mr. Boomer was a true leader. After graduating from Wayne State, he joined The Boomer Company, a construction materials distributor founded by his grandfather in 1903 as a coal supply company. In 1960, he succeeded his father as president and led the company into a new era in Detroit’s construction industry. He served on the board and as Chairman of the Builder’s Exchange of Michigan (now the Construction Association of Michigan) and The Associated Construction Distributors International (ACDI). In his community, Mr. Boomer took on many leadership roles and was as generous with his time as he was with his wisdom. He served on several boards in the Grosse Pointe and Detroit communities as well as in his beloved Pointe aux Barques community where he met his wife of 63 years, Anne Knapp Boomer, originally of St. Louis. 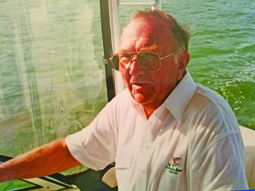 After he retired they spent winters in Boca Grande where they enjoyed being part of the Trestle Cove Yacht Club, attending services at Our Lady of Mercy, and participating in community events. They also loved to travel and visited more than 50 countries together. Mr. Boomer was predeceased by his wife who passed away July 24, 2016. He is survived by their five children, George (Allison) of Oregon, Anne “Muffy” Milligan (Edward) of Michigan, Robert (Julia) of Michigan, Catherine (Stephen Germic) of Michigan, and Ellen of Washington, DC; their five grandchildren, Maxwell and Andrew Boomer, Scot and Charles Milligan, and Eloise Germic. His is also survived by one sibling, Susan Boomer Brumback of Orlando, Florida, her three daughters, and many cousins. A memorial service will be held for Bob and Anne on Thursday, June 15, 2017 at 10 a.m. at The Grosse Pointe Academy, 171 Lakeshore Road, Grosse Pointe Farms, MI 48236. In lieu of flowers, donations may be made to the following: The Grosse Pointe Academy; The Suncoast Humane Society, 6781 San Casa Drive, Englewood, FL 43224; or The Paragon School, P.O. Box 540507, Orlando, FL 32854 (www.paragonschool.org).